24 Don’t you know that those who run in a race all run, but one receives the prize? Run like that, that you may win. 25 Every man who strives in the games exercises self-control in all things. Now they do it to receive a corruptible crown, but we an incorruptible. We are all called to run our own unique race. In Hebrews 12:1-2, the writer encourages us to fix our eyes on Jesus as we run the unique race set out for us. We are called to throw off everything that hinders us and the sin that can so easily trip us up and run our race with perseverance. It is interesting to note that your race is different from my race. I can't run your race and you can't run mine. We can only be ourselves and fulfill the destiny that God has for each one of us. 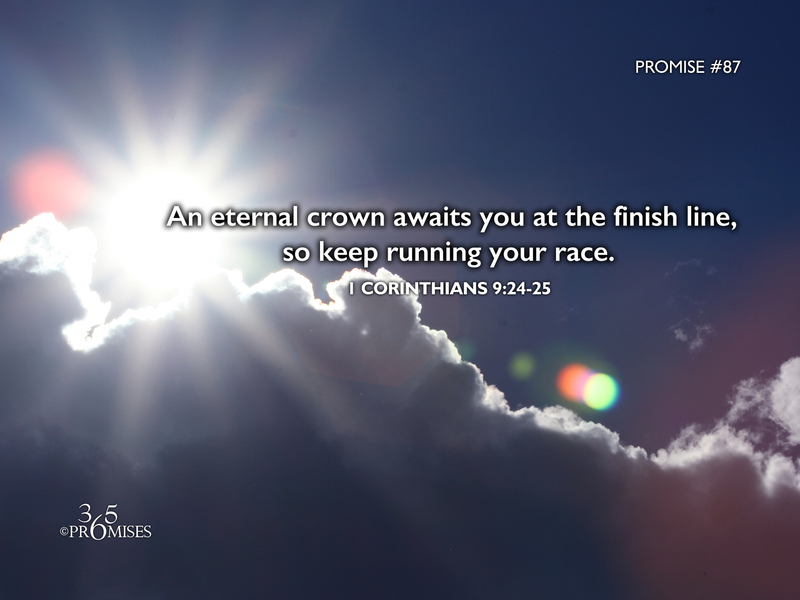 The encouragement for today is knowing that an eternal crown awaits each one of us at our finish line. There is not a solitary crown given to the fastest runner, or the runner with the most endurance, but for everyone who finishes! It is amazing to think of our Heavenly Dad's heart where everyone gets a prize! No one is left out. So keep running your race. Don't stop. Keep your eyes fixed on Jesus, who is waiting at the end of your running lane ready to present you with a crown of glory that will last forever!